Our Premier Designs Wind Garden Spinners will dazzle your neighborhood. The Flying Birds Wind Spinners delightfully embrace the colors and markings as seen on their natural counterparts. Multicolored spinning wings provide a realistic flying effect. Made from DuPont SolarMax and heavy-duty hardware, they are durable, eye-catching outdoor garden ornaments. Everything you need is included and these Premier Designs Wind Garden Spinners are very easy to assembly without any tools! Each garden wind spinner comes with two heavy duty fiberglass poles and a ground stake. These latest designs incorporate a low friction hub with double-locking pins. Our garden wind spinners are manufactured using the highest quality Solar Max. The UV fade resistant fabric is made by DuPont to provide you with years of entertainment. *Premier Designs Wind Garden Spinners incorporate images that are substantially larger and more realistic than other brands of spinners. *Premier Designs Wind Garden merchandise are encased in protective vinyl bags with detailed easy-to-read instructions. *SolarMax provides a very durable and attractive fabric that also stands up to bright sunlight and strong ultraviolet radiation. *SolarMax retains nylon's traditionally great ability to fly in very light winds. Its unique structure allows full dye penetration for bright, long-lasting colors without damaging the nylon fibers. SolarMax represents the pinnacle of nylon flag material development from the world's leading maker of nylon flag fabrics. 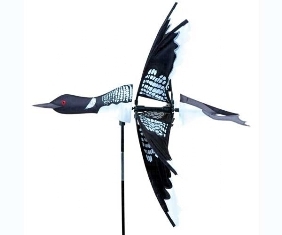 *Patented low-friction hub on our Premier Designs Wind Garden flying bird spinners allows each wing to spin in the slightest breeze, and extends spinner life by minimizing wear on the components. *Premier Designs Wind Garden Spinners use unique, strong fiberglass support poles with steel ferrules and heavy PVC ground stakes for durability in harsh conditions. *The rotating center hub on each garden wind spinner does not catch or bind, and assures you that each of your spinners will always face into the wind, increasing its spinning movement. *Molded metal and plastic fittings won't bend, strip or break, and are designed to keep your spinner looking great for years, ulike fragile materials other brands use that tend to wear out after only one season. *Dimensions : 24" x 11.5"